One liners for your bio, social status, self-talk, signs, wallpapers, tattoos, SMS, Facebook, WhatsApp, Snapchat, Tumblr, Twitter, Pinterest, Instagram, etc. Let us live simply in the freshness of the present moment, in the clarity of pure awakened mind. Prepare yourself so that you have no regrets. Think now. The things that you do, like trying to get rid of your competitors, and making one more million dollars, are they going to bring you a peaceful death? Are you really going to be happy when you die? While it may be difficult to change the world, it is always possible to change the way we look at it. The basic root of happiness lies in our minds; outer circumstances are nothing more than adverse or favourable. Happiness is a skill, emotional balance is a skill, compassion and altruism are skills, and like any skill they need to be developed. That’s what education is about. We do all kinds of things to remain beautiful yet we spend surprisingly little time taking care of what matters most: the way our mind functions. We don’t mind spending 15 years on education, why not the same to become a better human being? We deal with our mind from morning till evening, and it can be our best friend or our worst enemy. Wisdom and compassion should become the dominating influences that guide our thoughts, our words, and our actions. 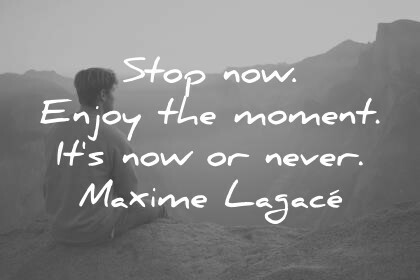 Learn more about happiness, meditation and Matthieu Ricard. Yesterday is history. Tomorrow is a mystery. But today is a gift. 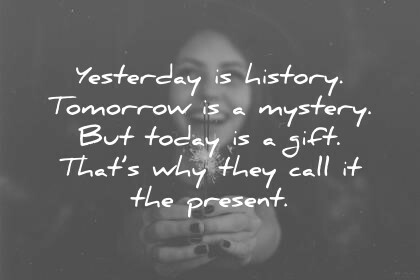 That’s why they call it the present. What is your favorite quote? Would you like to add another one here? Please let me know in the comment section below! albert einstein bible brother buddha dalai lama death famous friendship funny god grateful gratitude happiness health helen keller henry david thoreau inspirational life love mahatma gandhi marcus aurelius maya angelou mother teresa peace positive quotes ralph waldo emerson rumi short success what is william shakespeare work zen. This quote goes with my trip to Grand Lake 4th of July 2011 not long after my Bi-Lateral Mastectomy done on Friday, May 13, 2011. I sat by the lake minus both breast watching women in bikinis walk along the water way. I was filled with anger on ‘Why me?’ It wasn’t until my eye caught the glimpse of a young boy and his big brother hoping to get a picture in the water. They had a laugh and smile that was contagious then I knew. It seems the young kid was a left leg amputee from knee down an handsome young man was a right leg amputee from the knee down. I’m grateful to have received a very important life message that day. Thank you! Thanks Christina for your message. Whining is indeed the easy route. I think most of us do this, myself included. That’s why we must be alert and wise to catch ourselves. And that’s why I like to use short quotes for my self-talk like ‘Be happy where you are’, ‘Love’, ‘Nothing’s missing’, etc. Thank you for this compilation. Found this as one of the most comprehensive online! You made me smile with your comment, Natalie. Very gratitude quotes thoughts you are shown in your this site and it`s very good for the people. This blog is so nice to me. I would like to say you thanks! Thanks for your comment, Johniq! I bookmarked your post and will read again n again. I thank God each day for the use of my entire being. I have a great destiny and I need to be in perfect health to reach humanity. Some one somewhere is waiting for me to get it together. When I can help myself, then I can help others. I believe Leader’s has been assigned so many soul’s to touch. That’s why I don’t despise small beginning’s. What will be will be. Oh give thanks unto the Lord for. He is good and his mercy endures Forever. You can Trust God….. Very Nice article. Appreciate your effort. Yes, that’s a huge difference. It’s so easy to simply say things, politely. Thank you for this compilation. Found this as one of the most comprehensive online. Appreciate your work. Good for readers! Thanks for your message Aamir.